When reading the synopsis of a potential new read, there are certain words and phrases which almost guarantee I will love the book. With phrases like, former psychiatric home, witches, suspicious villagers; I instantly knew The Lingering was my kind of read. Married couple Ali and Jack are looking for a change. They want a new life free of bills, stress, and jobs. The Rosalind House Community Project is just what Ali and Jack need. Located in northern Scotland, The Rosalind House and its residents are independent of everything Ali and Jack want to escape. When they arrive the normal order of the house is disturbed, strange things begin to happen. Some residents suspect Ali and Jack are the cause of the upset, but The Rosalind House has secrets which date back long before Ali and Jack arrived. Secrets which refused to be buried and are revealing themselves in a chilling and terrifying manner. The Rosalind House is a main character in The Lingering alongside Ali and Jack. The house has a dark history going back to the 1800s. Death and suffering hover over the house like a dark cloud. People who live in the nearby village are wary of those who reside at The Rosalind house. Stories of the tragic events which occurred in the house have become local lore. Books which feature a house as a major aspect of the plot are some of my favorite books. I enjoy reading about the feelings people experience when they enter the house as well as how their actions are influenced. I find these types of stories are usually the most atmospheric and mesmerizing. The Lingering is no exception to this rule. I understand the appeal of a commune. A group of people coming together who share the same ideals working towards a common goal. Putting everyone’s strengths to use and making them all feel as if they are an invaluable asset in reaching the group’s goal. Although the residents work towards a common goal and aim to treat each other with respect, I could not help but be suspicious of each character. Why did they join the commune? Are they running away from something? The remote location along with characters who have isolated themselves from the world made The Lingering a locked door mystery with loads of suspense. The Lingering features some supernatural elements. I usually steer clear of these types of books but my last few reads have contained mystical elements and I have truly enjoyed them. 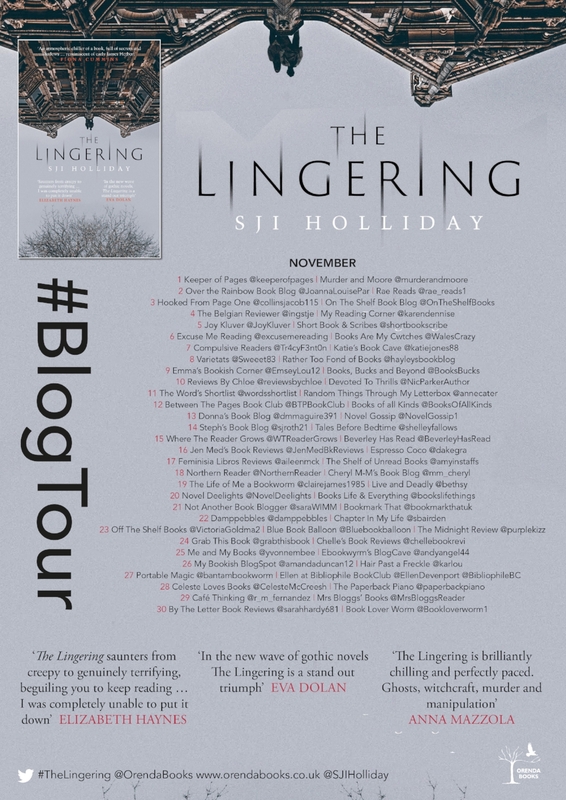 The Lingering is a unique and chilling addition to the latest trend of crime fiction with a gothic twist. Fans of The Death of Mrs.Westaway by Ruth Ware and The Craftsman by Sharon Bolton should add The Lingering to their list of must reads.